Austin Horn ClassicsPrimrose Pieced Pillow, 18"Sq. 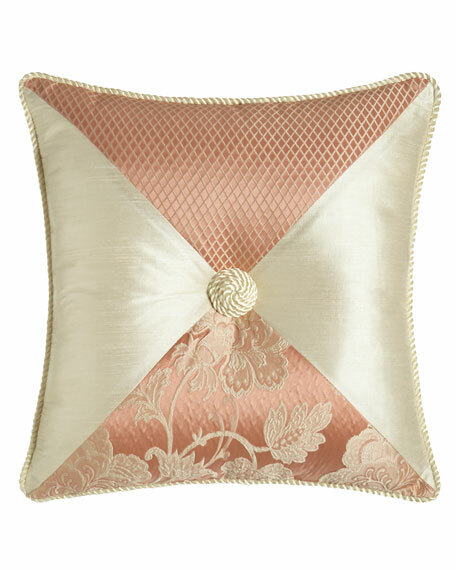 Austin Horn Classics Arabesque Pillow, 20"Sq. Silk pillow with Arabesque chenille jacquard center framed with gimp. Center is woven of rayon/polyester/cotton. Pillow is finished with cording. Silk pillow with Arabesque chenille jacquard center framed with gimp. Center is woven of rayon/polyester/cotton. Pillow is finished with cording. 20"Sq. Dry clean. Made in the USA of domestic and imported materials. EXCLUSIVELY AT NEIMAN MARCUS Pillow with patterned center and striped border. Cotton/polyester. Pre-washed fabric Spot clean. 18"Sq. Made in the USA of imported materials.